Whether it involves planting poppies, honoring Texas WWI Medal of Honor recipients, or commemorations ceremonies around the state (and the globe), Texas Chapters of the National Society Daughters of the American Revolution (NSDAR) chapter have been front and center. 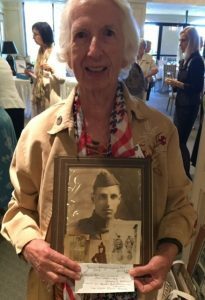 Texas communities and organizations planning WWI Centennial commemoration events have a ready partner in their local Daughters of the NSDAR. The NSDAR (often simply known as DAR) is a proud partner with the World War One Centennial Commission, and they have already initiated or participated in WWI Centennial commemorations in many different ways. In Texas, DAR chapters have been working to honor the Centennial, too. The exhibit “America and World War I” was featured at the DAR House during the Texas State Fair. Texas chapters donated $75,000 to the Veterans War Memorial of Texas in McAllen (which honors veterans of all wars, including WWI veterans), laid a wreath at WWI Memorial in Galveston, and arranged a collection of WWI memorabilia for the TXDAR World War I Project (part of the Briscoe Center exhibit on display at the University of Texas Bass Concert Hall). In 2017, San Antonio Daughters (12 NSDAR chapters) were particular active. On April 5-6, members assisted with Commemoration events at the State Capitol and passage of a resolutions by the State legislature. In May, members of one San Antonio chapter held a WWI family artifact sharing event. 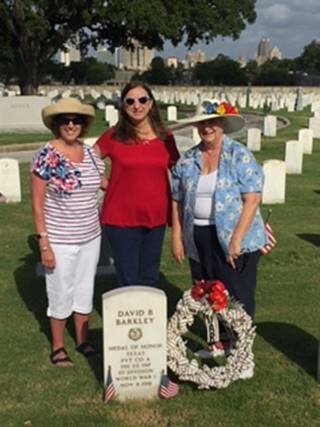 The Green Mountain Boys Chapter conducted a wreath-laying ceremony at the grave of Texan David Barkley on July 4, 2017. Barkley was the first Hispanic Medal of Honor recipient and one of four Texans to receive the Medal for actions in the Great War (his was posthumous). In December, Lorena Repaal coordinated with members, the U.S. 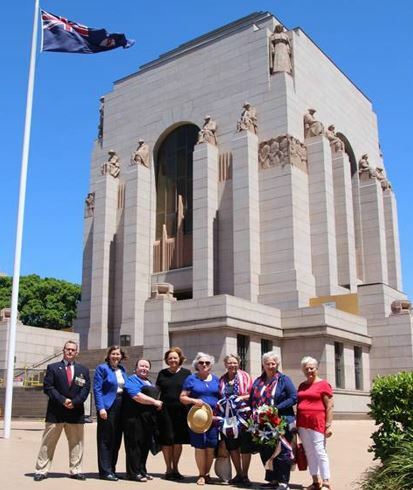 Counsel General, and Australian veterans groups to orchestrate a wreath-laying ceremony at the ANZAC WWI Memorial in Sydney, Australia on behalf of the Texas DAR and the Texas WWI Centennial Commemoration. In North Texas, chapters created, funded, and installed a granite monument honoring WWI on the Collin County Courthouse grounds. Lady Washington Chapter members laid a wreath in honor of the parishioners of Trinity Episcopal Church in Houston that served in World War One. A Waco chapter conducted a ceremony at Carleen Bright Arboretum in Woodway honoring veterans of WWI. Other Texas Daughters are giving presentations, marking graves, taking photos, laying wreaths and finding many other ways to commemorate the WWI Centennial. The list of activities goes on and on and will undoubtedly continue to grow in 2018. Bottom line for 2018 Texas WWI Centennial commemorations planning? 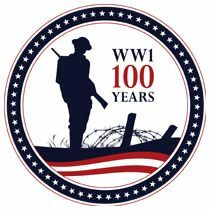 If you have a DAR chapter in your community and haven’t reached out to connect on collaborating on WWI Centennial commemorations, now is a great time. Find chapters in your area at http://txdar.org/?page_id=564. 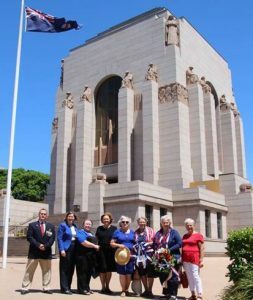 Lorena Repaal and other officials at the ANZAC WWI Memorial in Sydney Australia, December 11, 2017. Nationally, special recognition of the WWI Centennial was given during last year’s Continental Congress and the DAR Americana Collection opened a special exhibit about the work of DAR members throughout the war during the weeklong conference. Other National efforts to promote the WWI Commemoration include the 2017 American History Student Essay Contest, for students in grades five through eight, required students across the nation to focus contest entries on the topic, “World War 1: Remembering the War to End All Wars”. The DAR has embraced the poppy program and offers poppy seed packets at the DAR Store. There is a DAR WWI Centennial Commemoration Facebook page where chapters across the nation and the world share activities. The NSDAR will likely be part of WWI Memorial dedication activities in November of 2018. The memorial is within walking distance to the National Headquarters and the DAR partnership with the WWI Commemoration began shortly after the USWWICC was established by Congress in 2013. Special thanks to Ann Dennis, Kathy Hanlon, Lorena Repaal, and Debbie Wall for their contribution to this article and their work promoting the DAR-USWWICC collaboration.